Last week, mental_floss asked for input on three possible covers for the upcoming magazine issue. 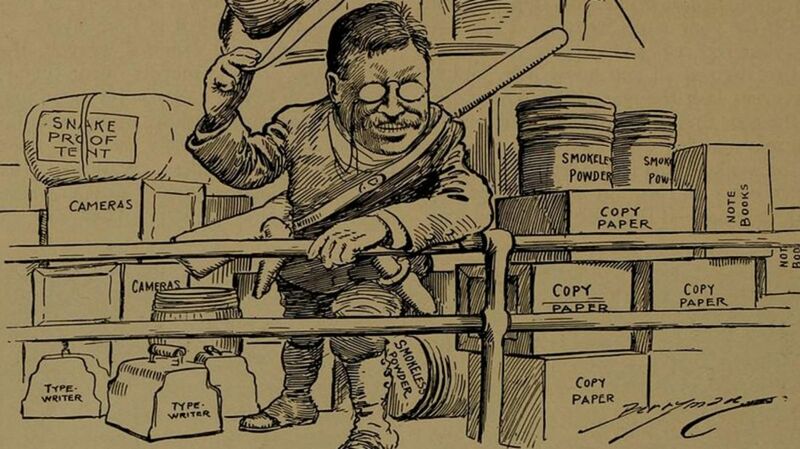 The one featuring president Theodore Roosevelt was the favorite among commenters. I don't know which cover was selected, but it made me think of the many ways Roosevelt stands out in history. Here are just ten, in no particular order. One commenter mentioned that readers of this blog would not know who Teddy R. is. That would surprise me, but maybe this will help you know him a little better. 1. At 42, he was the youngest person to become president, when President McKinley was assassinated (although not as young as this earlier picture would indicate-I just like the picture). He was also the first to succeed to the office after a president's death, andthen to later also win by election. 2. His other jobs were quite varied: cattle rancher, deputy sheriff, historian, naturalist, explorer, author of 35 books, police commissioner, assistant Secretary of the Navy, governor of New York, war hero, and lawyer. 3. He was a Rough Rider. In 1898, he resigned from the Department of the Navy and organized the First U.S. Volunteer Cavalry Regiment, known as the Rough Riders. Among other battles, he led the charge up San Juan Hillin the Spanish-American War. 4. Roosevelt called his governing philosophy "Square Deal," meaning fair dealings between businesses, consumers, and workers. He opened 40 antitrust cases against corporations. He promoted safe handling regulations for food and drugs, fought against misleading advertising, and encouraged arbitration between businesses and unions. 5. As the first conservationist president, he spearheaded the creation of the United States Forest Service, and established five new national parks. He was responsible for the start of the Wildlife Refuge system. During his administration, 42 million acreswere set aside as national forests, wildlife refuges, and areas of special interest (such as the Grand Canyon). 6. The teddy bearwas named after Roosevelt, in response to a cartoon showing the president refusing to shoot a bear after it had been tied to a tree. He considered it unsportsmanlike. 7. Roosevelt knew an opportunity when he saw it. The French had abandoned construction of the Panama Canal largely because of malaria and yellow fever. In 1904, Roosevelt contracted the U.S. to build the canal in return for control over the area. He dispatched surgeons and sanitation engineers to tackle the mosquito problem, then teams and heavy equipment to complete the canal, which opened in 1914. 8. Then there's Mt. Rushmore. The father of our country, the author of the Declaration of Independence, Honest Abe, and Teddy. How cool is that? 9. He was a trendsetter. Roosevelt's Wikipedia entry has a list of presidential firsts, including the first president to refer to the presidential mansion as the White House, host a black man at a White House dinner, appoint a Jewish person as a cabinet member, travel outside the United States while in office, and fly in an airplane. He was also the first American to ever win a Nobel Prize, for Peace in 1906. 10. With the possible exceptions of our current leader and his immediate predecessor, he has the absolute best macros posted to LOL Presidents. As a bonus postscript, the president's son, Brigadier General Theodore Roosevelt, Jr.distinguished himself at the Normandy Invasion on D-Day and earned the Congressional Medal of Honor. In 2001, President Roosevelt himself was awarded the Medal of Honor posthumously for his service at the Battle of San Juan Hill, the only president to ever be so honored. PS: Lots more cool things about TR are in the comment section!